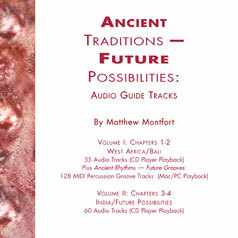 The previous issue of the Ancient Future Times reported on the challenges facing music in the digital age and Matthew Montfort's efforts with the Content Creators Coalition to make positive change to mitigate the tech industry's "creative disruption" of the music business. We asked for help, and are happy to report that progress is being made! Ancient Future Signs Fiscal Sponsorship Deal with InterMusic SF! Ancient Future has been experiencing a shortfall between the income that comes in from concerts and recordings and what is needed to support our mission. Donations can help make up the difference, and we are proud to announce that Ancient Future has been accepted for fiscal sponsorship with InterMusic SF (formerly San Francisco Friends of Chamber Music). InterMusic SF is a 501(c)(3) Non-Profit Organization, and now donations on behalf of Ancient Future are 100% tax deductible to the full extent of the law. Like the symphony, Ancient Future's world music rehearsals and performances cannot be supported by ticket sales alone. Yet arts funding has been cut drastically, especially in the USA and in California, and the advancement and indeed survival of the art of music is at stake. Your tax deductible contribution can help support Ancient Future's local Northern California concert season, or provide seed money to bring Ancient Future to perform in your area. Photo by Michael Braden of Bui Huu Nhut Recording A.F.A.R. In 2017, there were over 1.5 million streams of tracks on Ancient-Future.Com Records. Over 95% of those streams were ad supported, and 89% were on YouTube. Unfortunately, YouTube only paid $0.00006 per stream. Streaming rates were allowed to be set so low partly due to the assertion that free streaming would result in increased sales, but for the year that saw an unprecedented 1.38 million ad supported streams of tracks from Planet Passion, only 233 track downloads from the record were sold. A music distribution system dominated by ad supported streaming does not support the creation of new recordings, so we have been exploring another way to fund recordings. The concept of the Archive of Future Ancient Recordings (A.F.A.R.) is to involve fans of world fusion music in supporting the production of an archive of live and studio recordings of cross cultural collaborations. The best of these recordings will be selected to be released commercially at a "future" date, at which point they will be on their way to becoming "ancient" recordings, hence the title. There are already more tracks in the archive than will fit on a CD, and there are three new studio tracks currently in production that will add over 30 more minutes of music to the archive. There are four supporter thank-you packages available ranging from $15 to $75 offer everything from 128 kbps mp3 downloads all the way up to 96k 24 bit hi-res recordings. Detailed information on the various supporter packages and the benefits included can be found at www.ancient-future.com/afar.html. And now you can make a tax deductible donation to the project at the Ancient Future donation page on InterMusic SF! And Volunteer to Create a World Fusion Support Organization! InterMusic SF also provides workshops and support to help affiliates grow their organizations and apply for grants. The last issue of the Ancient Future Times asked for volunteers to help with fundraising, promotion, and booking tasks. Since then, there have been meetings to discuss creating a team of volunteers and benefactors. Some work has already been done by a wonderful volunteer who helped with updating Ancient Future's concert presenter database. Director of Solicitations, Begging, and Busking. Duties include raising money for activities, applying for grants, and helping to build a non-profit organization to support world fusion music. Concert Circuit Creator. Duties include developing a circuit of world fusion friendly presenters and booking concerts. Anti-Social Media Manager. Duties include supporting and keeping in touch with those who have joined the #DeleteFacebook movement while encouraging cross-cultural pro-social communication on Facebook, Twitter, Google+, and other social media sites. Traditional Media Archeologist. Duties include searching through the charred remains of the traditional media to locate the whereabouts of current media contacts to maintain a database of world fusion friendly media. Anyone interested in stepping forward is encouraged to email info@ancient-future.com. The positions could eventually become paid ones once sufficient financial support is generated by a genius Director of Solicitations, Begging, and Busking. One of the variations of the trailblazing world fusion music ensemble, Ancient Future, this duet features world guitar pioneer Matthew Montfort accompanied by Uzbek percussion virtuoso Abbos Kosimov. This improvisatory program focuses on the world music traditions of Central Asia, India, and Europe, renditions of music from Ancient Future's ground breaking world music recordings, and new unreleased works! Adm: $15. Tix at watermelonmusic.com. 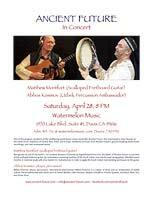 Info: Call 530-758-4010 or email info@watermelonmusic.com. Doors open at 7:30 PM. The leader of Ancient Future, Matthew Montfort, released his first solo recording, Seven Serenades for Scalloped Fretboard Guitar, in 2009. He is a pioneer among guitarists who have had their fretboards scalloped in order to play various forms of world music that require intricate note-bending ornaments while still being able to play chords. 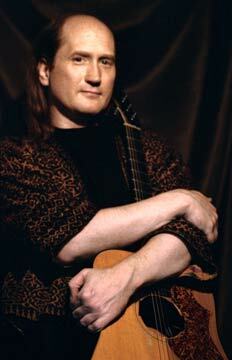 He is recognized as one of the world's 100 Greatest Acoustic Guitarists by DigitalDreamDoor. He has performed concerts worldwide, from the Festival Internacional de la Guitarra on the golden coast of Spain to the Festival of India in Mumbai, and live on national shows such as the Rachel Maddow Show on MSNBC. 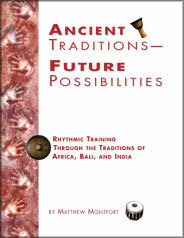 Montfort wrote the book Ancient Traditions – Future Possibilities: Rhythmic Training Through the Traditions of Africa, Bali, and India, which has been used by many musicians to improve their rhythm skills. 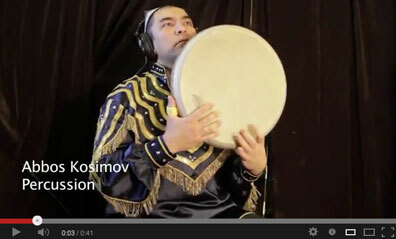 International phenomenon Abbos Kosimov is a master of the doyra (a frame drum with metal rings) and an ambassador of Uzbek culture. Abbos is known for taking the doyra to unprecedented new heights. 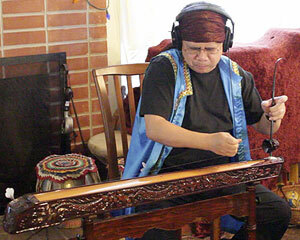 He developed finger tapping techniques inspired by North Indian tabla masters, adding new dimensions to the instrument's sonic capabilities. 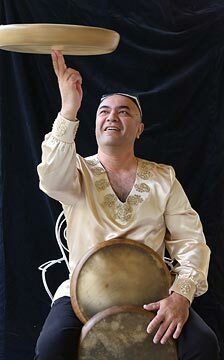 Abbos also plays qayroqs, darbuka, dof, and riqq. Abbos was born in Tashkent, Uzbekistan, to a highly musical family. His father played santoor (hammered dulcimer) and his brother played ney (flute), and began studying doyra at age ten. In 1988, Abbos graduated from the College of Culture and Music under dorya master Mamurjon Vahbov. Abbos completed his higher education at the Tashkent State Institute of Culture in 1994, and established his own Abbos school where he taught the most talented youth of his country to play doyra. In honor of the 10th anniversary of Uzbekistan's Independence, Abbos was awarded with a medal and given the illustrious title of Honored Artists of Uzbekistan by the president of Uzbekistan. In 2005, Abbos moved to the United States, leading to performances and recordings with artists such as Steve Wonder, Zakir Hussain, Giovanni Hidalgo, Terry Bozzio, Swapan Chaudhuri, Kronos Quartet, and Omar Sosa. Abbos released his solo album, Infinite Rhythm, in July 2012. That same year, Abbos met Ancient Future leader Matthew Montfort when they were both hired to perform with renowned Indian singer Pandit Binay Pathak. Abbos has since recorded tracks for Ancient Future's fan funded recording project, The Archive of Future Ancient Recordings. 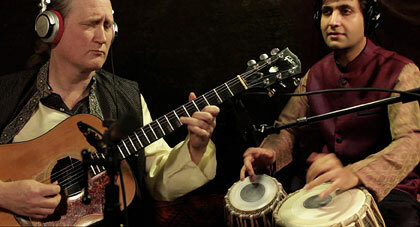 The finale concert of a series of free hour long educational concerts by Ancient Future at Sonoma County libraries will introduce the audience to Indian rhythms and feature scalloped fretboard guitar pioneer Matthew Montfort accompanied by Indian tabla virtuoso Vishal Nagar. Free. Info: 707-996-5217 or visit www.sonoma.lib.ca.us. While the musical period that Ancient Future has inhabited has been marked by some wonderful innovations, there have also been declines in the public perception of the value of music and major budget cutbacks to music education in public schools. Raising new generations without exposure to music education cannot be good for the art of music, or society in general. We need to place more value on music, because it can bring people together in ways that other mediums can't. When President Bush visited Singapore in 2006, their diplomacy efforts included a gamelan performance. Invited to play himself, Bush beat a metalophone with a rubber mallet for a time, and then said: "I'm going to quit while I'm ahead." 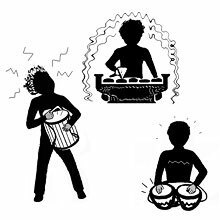 This is a shame, as he was obviously having fun and his first performance was greeted with applause by the members of the gamelan orchestra, as shown in World Rhythms News Issue 9. Imagine the conflicts that might be avoided if world leaders spent time learning the traditional music of their adversaries. While heads of state may not yet be studying world music, you can make a difference in your own life by learning the ancient musical traditions of the world. Below are some educational resources available from Ancient Future. The rhythmic and melodic aspects of the musical traditions of the world are a good place to begin one's studies. Timbre or tone color is often one of the first aspects of a musical tradition to be noticed by the uninitiated and many of the instruments in use in world music are very interesting subjects in themselves. The fundamentals in primary school education are often described as the three R's: Reading, wRiting, and aRithmetic. This world music training course concentrates on the three T's: Time, Tune, and Timbre. The time portion of the training includes introductions to the rhythms of West Africa, home of the astounding art of polyrhythms; Bali, where the interlocking rhythms of gamelan music fill the night air; India, birthplace of tala (rhythmic cycles); the Arab world, home of iqa'at (rhythmic modes); and world fusion rhythms created by combining ideas from many traditions. The tune portion showcases rich melodic content of the ragas of North India and South Indian vina music arranged for guitar. Under timbre there are articles on North Indian sitar, South Indian vina, scalloped fretboard guitar, Andean charango, North Indian tabla, South Indian mridangam, Balinese gamelan, and the percussion of the Ewe orchestra of West Africa. 30 Minute Skype Lesson.$50. Sale $36. Buy 1 Now. Custom private 30 minute online lesson via Skype or other video conferencing service. Matthew Montfort offers online lessons in the subjects covered in the educational section of Ancient-Future.Com via Skype; rhythm workshops at conservatories, public schools, and resorts; and instruction for all styles of guitar, ukulele, bass, mandolin, sitar, and other plucked instruments.